“I don’t want to die,” the maiden said. 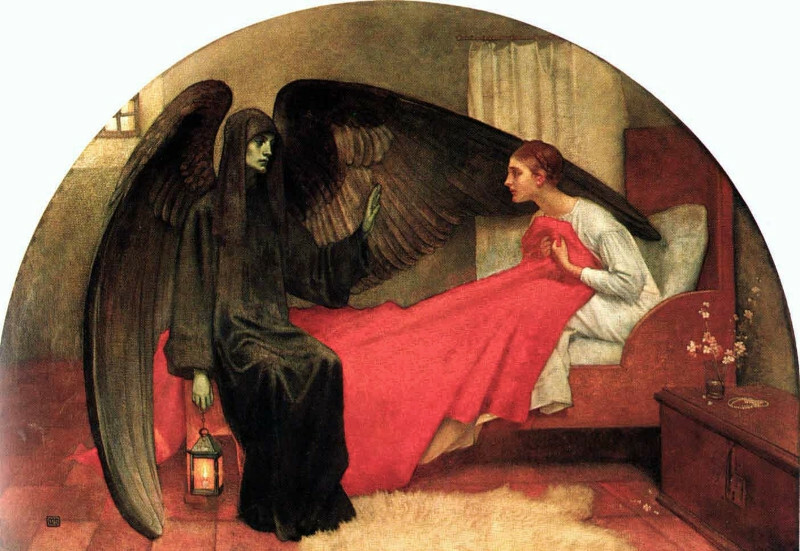 Death had come, pale-faced, draped in dark robes, black wings spreading from her back. “Quiet,” she said, and the maiden hushed. She raised her lantern and light poured into the maiden’s eyes. The girl turned away, and Death nodded. “Your time has come. I will take you,” she said, reaching forward. But the maiden turned back and shielded herself with the thick, red blanket. The maiden shook her head. “I thought I could be brave, but with you comes a cold colder than the earth and in your eyes there’s nothing. I know what awaits.” Death shook her head. “Come and escape the toil of this life. If death is loneliness, life is alienation.” Death caressed the maiden’s hand. “I know what the red blanket hides—what disguise has been rubbed away.” The maiden flinched. “Yes,” said Death. “Skin so fair, cheeks so red, but beneath is something more akin to mud, or filth. You won’t hide from me but you hide from them. One day they’ll catch you and the rest they give you won’t be as merciful as mine. Come,” she bade. The maiden shook her head. “Not yet. I can’t.” She shielded her eyes and swung blindly at the phantom. “Begone!” she commanded, and in a swirl of smoke Death disappeared, but seemed to linger. The maiden thought of calling the specter back but didn’t. “Grandmother will know,” she said, and ran to tell the old woman the story. Her grandmother listened quietly and cupped the maiden’s cheeks in her hands. “The wise men do lie,” she said, “and in this life there is only struggle. But in struggle there is beauty.” The maiden sighed. When she rose from the old woman’s side she was more tired than she had been before. She returned to bed dreading the morning sun.